1823. A Stephen Lyhane, of Kilnamrtyra, married a Joanna Healy, of Ballyvourney, in Kilnamartyra, county Cork on 2/12/1823 - RootsIreland & NLI & now Online!. Kilnamartyra is just west of Macroom. A Stephen Leehane was baptised in Gortanamill in 1818 to Timothy Leehane & Mary Roddins- could he have been a cousin or nephew of the Stephen above who married in 1823. But we have yet to prove that this is the correct marriage for Paul's Stephen! - and, as of January 2015, I was almost positive it was NOT . But, June 2015, with another all 37 DNA marker match with a descendant[ Jim Lyons] of Daniel Lehane ~1843 Ballyvourney -the neighbouring parish to Kilnamartyra- I am having 2nd thoughts!! Dennis Lehane was thought to have been born 3/3/1829, to father Stephen and mother Joanna/Johanna - in Kilnamartyra- a Boston genealogist suggested this couple to Paul . .. This birth date, plus the name of Stephen as his father, are taken from his 1906 d.c. Parish records show a Dennis baptised to the couple above in 1832, but so far the only other children baptised to them there are Catherine 1825, Daniel 1827 & Patrick 1829 [ Paul obtained a fiche of the baptism records from the LDS and I have searched on RootsIreland ]. See Lehane baptisms. So, I thought I was pretty sure the Kilnamartyra Stephen Lyhane was not the one we are seeking - as of Jan2015. After 1832 the couple could have moved to another parish and had children baptised there, but we are still left with the 3 year difference in Dennis' baptism- though the same month!!. Paul states that Stephen & Joanna had children Dennis, Daniel, Cornelius, John & Kate. . .Cornelius, 13, & John, 11 do arrive with Dennis Lehan, 20, & Johanna, 40, on the August 1852 ship from Liverpool, the New World. Daniel and Kate arrived later, maybe ~1864. 1852. 11/8/1852 His son, Dennis Lehan , 20, from Ireland, arrives on the ship New World in New York from Liverpool with 2 more of his children- Cornelius 13 & John 11, and his wife Johana, 40 - mistakenly called the 'wife' of Dennis. She is actually aged 42-50 from 3 Census records & her dc. 1859/1860. .His son was naturalised as Dennis Lane . So far I do not think the naturalisation papers for Stephen & Joanna have been found/bought . Any update on this Paul?? No John here- John was born~1841-1844 [from date on 1852 arrival & from 1880C] so would have been ~16-19. Has he already gone west for gold?? No Daniel or Kate either - But we, maybe, know from 1900C that Daniel arrived in the US ~1864, maybe with Kate - they both first appear in 1870C. Would it be possible to find their naturalisation papers? ?, or their arrival in a ship?? A John Lane, 30, carpenter,with wife Ellen and son John, 3, in Allegheny in 1870C . Still around in 1880C, aged 40, a new wife, Barbara, John13, James 10 & 3 girls - so CANNOT BE Stephen's John, as a John Lane aged 36, was living with Stephen in 1880C. 1880C. Stephen, 80, Johannah 70, living with Cornelius,age 30? ?, Daniel 38, Katharine & John at Allegany, Cattaraugus, New York. 1880 -1892 Stephen must have died - Paul did not find his name in the Allegeny death index. 1892. His widow, Mrs J Lane, died 28/12/1892, aged 90, Allegeny, supposedly 30 years in the US, of Old Age & probably cerebral apoplexy. Informant Cornelius Lane. Buried 31/12/1892, Allegeny, undertaker Blair McCorty? She had actually been 40, not 30, years in the US, and was nearer 83 from 1870 & 1880 Cs, but 88 from 1860C and, if Joana Healy then must have been born by 1808 to marry in 1823!!.. SO, LOOK for a Joana Healy baptised Ballyvourney 1800-1808, likely nearer the latter - do these early records exist?? What became of the above Cornelius & Katharine??. Daniel, 62, appears in the 1900C. Obtain the 1880 -1900 d.c. of Johanna Lane, last known, aged 70, in 1880C, living at Allegany, Cattaraugus, New York . Having got both of these - Dec2014- we are no further forward! http://www.newspapers.com/newspage/15927746/ Olean reviews 1880-1895 might give us the dates of Stephen's death, but even obtaining his d.c is unlikely to help!! An interesting article appeared in the press in 1935, with a connection to Turtle Point . I had thought John Stephen Lane, who died 1889 in Olean, could be a brother of Stephen Lyhane 1800. No- article is wrong about talking of the 1849 Goldrush- this person is in fact Stephen's son John, born ~1840 . Have maybe found him in Nevada in the 1870 census. *My understanding of the Ydna test that I had done was that I matched John Lyons for all 37 markers with a genetic difference of 0. This was my only match at 37 markers. My Haplogroup is R-DF21 according to the Tip info, John and I have an 89 % chance of having a common relative within 5 generations 74% in 3 generations. I believe I have found my ancestors in Ireland but I need a little more information to be sure I have the correct people in Ireland. The name in Ireland I am tracking is Lehane it appears to have been changed when my ggrandfather was naturalized 1859. I have found part of the family coming to the US in 1852. If I have the correct people in Ireland my ggrandfather came from Kilnamartyra Co Cork. I have what I believe is the Marriage of my gggfather to a Healy but I would like to find the birth of 3 or more of the children to this couple to make sure they are indeed the correct people. I am like many people struggling with the Irish information. I would be interested in communicating with you on Irish records / research. I have not posted any of the information I have on line but I do use family tree maker soft software, so if we do find a common ancestor I can share the info. Facts from Kilnamartyra parish records, gleaned from RootsIreland & online up to Sep 2016. A Dennis Lyhane baptised to the couple 1832. Have failed to find a John, Cornelius, [Stephen] , Dan, Kate baptised to them - might just be due to different spellings, but I doubt it.. Now have a Catherine baptised to them 1825 and a Daniel 1827- dates far too out- and a Patrick 1829- both this Catherine & Daniel might die and their names reused . ~1846 & ~ 1838-42. There are marriages of a Timothy Lehan in 1815 & 1822 , And a Timothy Lyhan, father John, was baptised there in 1803. Another Timothy baptised 1807, father not a Stephen, Patrick, John, Tim . or Corn.!! Griffiths has a Timothy Lehane in Ballyvourney, the adjacent parish. From Maria, Roots Ireland oct 2014. Probably a red herring: but a Catherine Lane born Drishane, Millstreet ~1800, arriving in the States in 1848, married by 1830 to a James Riordan, died in Olean 29/3/1888 , obituary in Olean Democrat but have not found it! - Wirkus Ancestry tree~ 7000 people and only 1 Lane/Lehane!! This is in fact the Catherine who married James Riordan - found 14/12/2014 - on Joan Riordan's tree, below! Yes I am originally from Olean NY. left there when I went to college back in 1969. 1. Any cemetery records for Allegany? I have not found anything on line so far that has been helpful and I am not sure where Johana was buried in Allegany I can't really read the DC. 2. Any thoughts on why you did not come across death for Stephen Lane 1880 onwards in that search you did? Not sure why I couldn't find him probably need to go back and try again I was there till they closed and as always there was more to be done. 3. Any thoughts on what happened to Katharine? I think you miss read this the picture was supplied by F. P Crowley from Turtle Point Pa. Turtle point Pa. is where Denis Lane settled and built a house. The fairly large brick house is still there today and is occupied by his decedents. Frank Crowley married one of Denis Lanes daughters and supplied the picture. Here is the link they sent me, not sure if you will be able to access it, It doesn't show any one who is currently alive or to much info beyond 1900 so not sure we know who to ask for the DNA. More work required there. It's so nice to meet you. Now, where do I start? At the bottom. In your second message "Stephen Lyhane/Lehane/Lane", at the very bottom, you mention a "Wirkus Ancestry tree". This tree is a dead end as they don't even have the Riordan Information correct. Most of the other trees that contain my Catherine Lane married to James Riordan belong to my cousins and are not up dated so please don't follow them either. I can't speak for the Lane side of the "The Lane Family Tree" (Ledbetter6466), but I do know the Riordan side is not correct. My tree "RIORDAN FAMILY TREE" (riordan-joan) is up to date and as correct as we can determine. My 2nd and 3rd cousins have worked on this long before I came along, but I picked up the torch some years back and am now running with it. As everyone was so concentrated on the Riordan side, I'm afraid the Lane's didn't get much attention. The one Lane I am sure about is Catherine married to James Riordan. Their daughter Hanora Margaret who married Patrick Lane, I can't confirm. My 2nd cousin Jerry Rodrigue who, for years, researched and compiled this information was sure, but he is slipping and we can't get him to focus on genealogy any more. He does have documents of some kind, but he won't let us go through them. In his notes, Jerry says this was confirmed through church records and says he also found Patrick's death of 07 Dec 1882 in the church records. I'm sure he is referring to St. Bonaventure. As you well know, what makes our search so difficult are the names in common. Johanna is prevalent in my Riordan side (including me) and in the Patrick Lane side. I sure wish I could be of more help, but I just don't have any more information. I only have my instinct which tells me there is a connection. One thing I can tell you is about the extensive research Jerry Rodrigue did on trying to figure out how James Riordan (wife Catherine Lane) and their 6 children arrived in Olean, NY in 1851 when they left Ireland in 1848. After exhausting ALL shipping records to the US around this time, he started looking into Canada. Though he didn't find our names, He did find that Logging Ships were a very common form of transportation for the Irish at the time. Tomorrow at work, I will scan and send you what he found. I can't do any traveling at this time as my husband is very ill and I can't leave him. So my research is limited but will do anything I can to help. The Olean area was so tiny in the 1850's, I want to believe we have a connection. Then, when you think of how common Riordan and Lane are, my hopes get a little dashed. Riordan in Millstreet, Ireland is like Smith or Jones here. With 2 Lanes in my family tree, both in Olean in the 1850's, one of them has to belong to you. James & Catherine's son James left a handwritten story just days before he died. I will send this to you tomorrow also. He says he was born 20 Dec 1834 in Millstreet, Ireland and that they left Ireland in 1848 and settled in Olean in 1851. We don't know where they were in between, ergo the Canada connection. 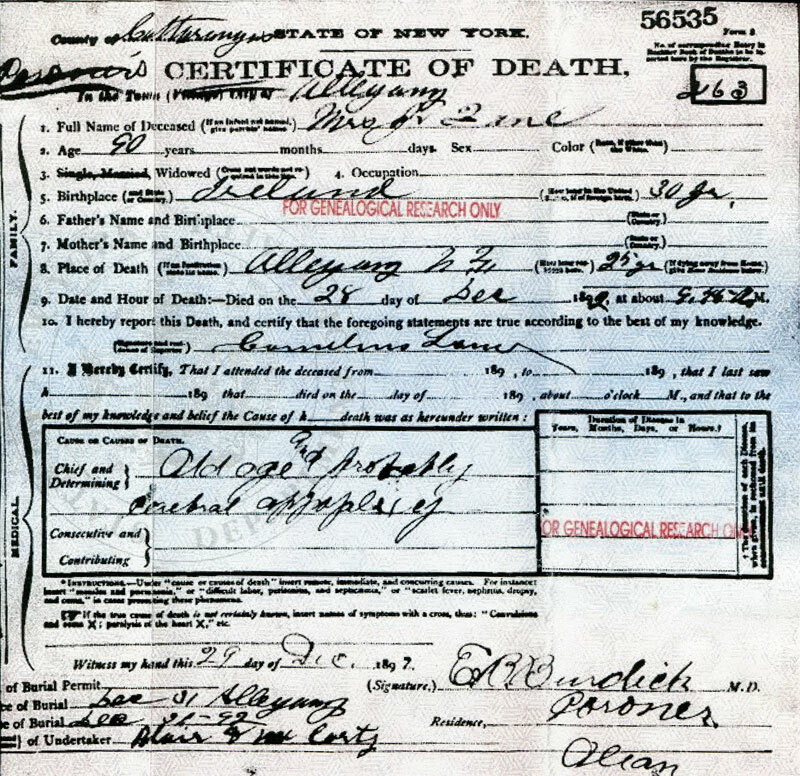 On this same James' death certificate, his mother is listed as Lane. We don't know if this is the correct spelling. No one has been able to make the Ireland connection for Riordan or Lane. Nor do we have any of the birth records for their children. It is believed there are 4 additional children for James & Catherine. When I get to Ireland, (whenever that might be) this is my first mission. New York is another trip. As for Jerry's records, when they moved 7 or 8 years ago, he stuck everything in boxes and hasn't been in them sense. It has been so long sense he did any research and Claudia and I have discovered a lot during this time, we are sure we can glean more information from his records, but unfortunately we have to wait. Also 2 Cornelius P/D Lyhane aged 56- in house 1, married 20 yesrs, 6 children, all alive - and 60, in house 2 , married 30 years, no children, & a farm servant- and a Michael J Lyhane, 27, in house 6, married 4 years, 3 children, and widowed mother Ellen 67 , all in Coolierher, Gortnatubbrid.